For this year’s Fringe, I’ve invented a crap new chat show format. I’ll be meeting a different guest comedian every day, hoping to discover more about the person you don’t see on stage. ‘Nervous laughs at the unpredictability of a lunatic merge into heartier guffaws for his bold set pieces, raw potency and inspired ideas’ (Chortle.co.uk). ‘He really feels like an undiscovered treasure. 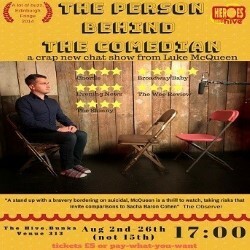 His anarchic and confrontational style is far from mainstream, but Luke McQueen is rapidly beginning to be regarded as a minor deity of the alternative comedy scene’ (TheWeeReview.com).